Reaching the mark of 100 album releases is a truly remarkable achievement for the esteemed UK record label Pressure Sounds, which started its acclaimed reissue programme back in 1995 with the compilation set “Santic & Friends – An Even Harder Shade Of Black”. During the past 23 years of its existence the label has put out some real exciting, sometimes hard-to-find classic stuff and, as if to celebrate this, Pressure Sounds does it again with its 100th release; the double set “Rockers In The Land Of Reggae” and “Words In Dub”. These two seriously sought after albums are reissued as single vinyl LP releases and as double CD pack with 3 bonus tracks on each CD. When Kingston-born Phillip Fullwood, a cousin of bassist George ‘Fully’ Fullwood, had moved to Linstead, St Catherine, he became a close friend of Freddie McKay. Then Phillip’s first foray into song-writing came with “Old Joe” for Freddie McKay, released on the latter’s debut album for Studio One. Not much later he met the young Winston Rodney aka Burning Spear, and was soon writing songs with Spear, and touring as a percussionist in his band. In the US they recorded “The Whole World Wants To Be Free” together, and also Phillip’s first lead vocal on “Love Everyone”. His close relationship to Burning Spear gave Phillip valuable insight into studio work, and his move into production and mixing was inevitable, soon resulting in the profound self-production “I Gave You My Word” in 1979, with arrangement and backing vocals by Winston Rodney. Also in 1979, Phillip Fullwood met Winston McKenzie from St Ann’s, with whom he would form the group I-Mo-Jah, which means ‘Unity’ in Swahili. In 1982 Phillip moved to the US where the I-Mo-Jah group, which had been started in Jamaica, gained a third member with young vocalist Cassandra Jenkins. While in the US, they started going over the riddim tracks that Phillip had brought with him on master tape, deciding which to re-record and create news songs over. 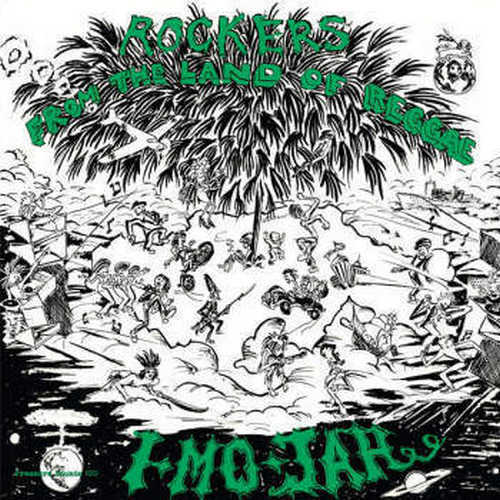 The backing tracks featured Jamaican musical dignitaries such as Sly & Robbie, Leroy ‘Horsemouth’ Wallace, Clive ‘Azul’ Hunt, Errol ‘Flabba’ Holt, Eric ‘Bingy Bunny’ Lamont, Aston ‘Family Man’ Barrett, Bobby Ellis, and Richard ‘Dirty Harry’ Hall, and would form the backbone of the “Rockers From The Land Of Reggae” album. New vocals were recorded at SFZ studio in Long Island and New Age Studio in Queens, with further overdubs on keyboards and lead guitar. Then the album’s distribution was seriously derailed by some unfortunate events and so soon vanished into obscurity. By 1983 Phillip Fullwood had settled permanently in the US and virtually retired from music. 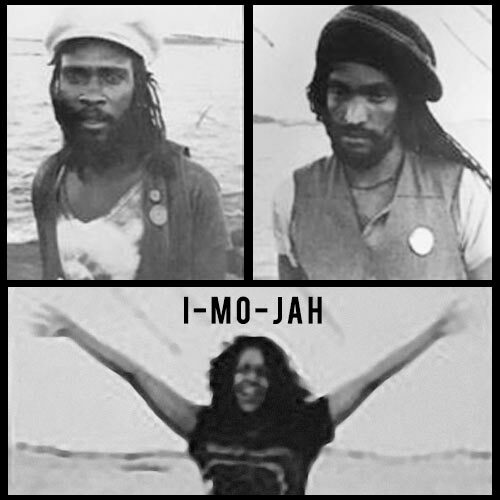 Due to the off-kilter mix and eccentric vocals of I-Mo-Jah’s “Rockers From The Land Of Reggae” it might take some time to fully appreciate this LP. Just like for example Wackies and Black Ark, this album has a special sound, one that very much differs from the common reggae sounds of the early 1980s. The more you play it, the more it becomes clear that this is a very intriguing and unique collection of tunes. Side One starts off with “Jah Love”, a mind-blowing tune with hypnotic sounding vocals and an awesome bass line. Next comes the extended version (5m51s) of “I’ve Been Hurt”, which musically is more interesting than lyrically. Then it’s time for this Side’s highlights to drop in. First there’s the message tune “Peace & Love”, in which they ask to “stop the fussing & fighting, shooting & killing, looting & stealing”. And then there’s “One Song / Jah Music”, an excellent and exciting tune that goes on repeat. Side Two opens with the solid “Love Everyone”, a longing plea for love and unity. A killer bass line is the driving force for the riddim of “Fools Rush In”, which is a majestic offering all the way. It’s followed by the decent “No Love” and the outstanding “Weeping And Wailing”, which is beautifully sad. Conclusion A thriller for reggae aficionados, who have a real interest in classic reggae sounds that go beyond the obvious.